Only half of the publics in Tunisia, Iraq, Palestine and Yemen view the human rights conditions in their countries positively. Yet representative surveys in all four countries show that public perception of human rights conditions is strongly correlated with public trust in security services and the justice system. Clearly, those who care about state building in these countries need to care just as much about human rights. But do they? Four Arab research centers recently issued a report on public perception of security sector reform and the justice system in their countries. This policy research aims to determine the level of progress achieved in security sector reform in the Arab world, as well as the standing of the security services and the justice systems. Part of the research was aimed particularly at diagnosing strengths and weaknesses in performance of these systems. 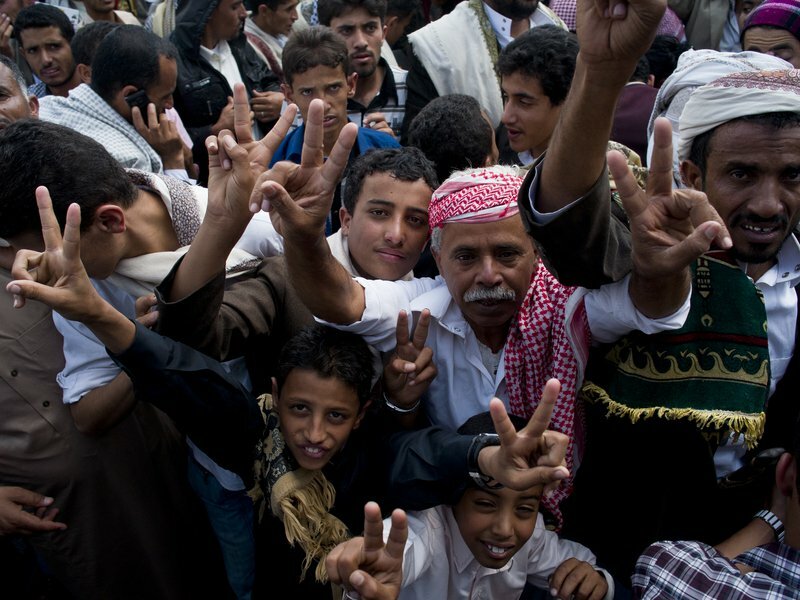 Protesters call for democracy and a change in government in Sana'a, Yemen. One of 12 indicators examined by the Arab researchers explored perceptions regarding human rights. Responses to 11 survey questions made up the score for this indicator. Tunisia, the most successful Arab Spring country, emerged with the highest score and Yemen, one of the least successful “Arab Springers”, came last. Iraq and Palestine were second and third respectively. Findings show that countries with higher scores for human rights also had higher scores for trust in security services and positive evaluations of the justice system. A positive correlation existed between the three variables: the higher/lower the score for human rights, the higher/lower it was for the other two. Victims or those with direct experience with the security sector and the justice system assessed the status of human rights in a more negative way than those without direct experience. The samples for this research included an additional number of interviewees representing those who were victims of or had direct experience with the security sector or the justice system in their countries. This research reveals another interesting finding: victims or those with direct experience with the security sector and the justice system assessed the status of human rights in a more negative way than those without direct experience. This finding was consistent across all participating countries, and the tendency to link human rights and the justice system was even more evident among this group than the general public. But in addition to experience/victimhood, what else drives attitudes regarding human rights conditions? Analysis of the data shows that two drivers play a fundamental role in shaping those attitudes: perceptions of one’s own safety and security and one’s own political and sectarian affiliation. Findings show strong interaction between these two drivers, reinforcing each other’s’ effect. A positive correlation exists between all three variables: the more positive a respondent was regarding human rights conditions, the more likely he or she felt safe and secure, and the more likely he or she was a member or supporter of a ruling party, faction, or sect. Simply put, those who are most safe and secure, and those who support a ruling party or sect, in all four countries, are more positive about human rights conditions in their countries. The role of political and sectarian affiliation and/or perception of safety and security is especially visible in Iraq, where a more positive view of the status of human rights was found among supporters of Shiite parties, followed by supporters of Kurdish parties and predictively among those who felt safe and secure. The situation was completely reversed, becoming highly negative, among supporters of Arab Sunni and secular parties; they tend to be the most insecure. A similar trend was found in Palestine among supporters of Fatah compared to Hamas supporters. It was also evident in Tunisia among supporters of al-Nahda (the ruling party at the time of the survey) compared to supporters of Nida’ Tunis (opposition), and in Yemen among al-Islah (Reform) Party supporters compared to supporters of the Yemini Socialist Party. In other words, if you support the ruling party or sect, you feel more safe and secure and your survey score for human rights conditions in your country will be high. If you support the opposition, you feel less safe and secure and your survey score will be low. The implications of this are clear: those who are interested in effective state building must address these two critical impediments to good governance: political exclusion and insecurity. Security sector reform must ensure the creation of professional services, removing them from the quagmire of factional or sectarian politics. Only a more professional security sector is able to address public concerns about human rights. While security is more difficult to ensure in an environment of political instability—such as Iraq, Yemen and Palestine—political inclusion ensures that all citizens, loyalists and opposition alike, share in the burden. Today, those in the opposition feel the most insecure and feel negatively about human rights in their countries. If they continue to be ignored, instability and unrest will persist. And if that happens, building a cohesive and democratic state where all citizens enjoy equal rights will never be achievable.